Little Miss Moneybags: Book Review: Who's Spying On You? In this age of social media, high-tech surveillance, and online banking, it's easy to feel like your every move can be tracked online - and in the real world. And, guess what? That feeling isn't lying to you. Popular Mechanics Who's Spying on You? covers the basics of the threats to your privacy through financial transactions, medical records, online activity, phone usage and even your home appliances. Well-organized and thorough with very recent case studies and examples, Who's Spying on You? can make you feel like you're living in a spy novel - who would be interested in my medical records, for example? Or following me around as I run errands? Mainly, advertisers. Petty thieves aren't generally willing to go to the trouble, and my life is not interesting enough for the government to keep tabs on me, but advertisers can and do pay for data that allows them to target us more effectively. If a company knows your demographic information, where you life, and where you are likely to shop, they can probably tempt you to spend money on their products. Well, okay. That's not awesome, but is there really any danger to it? I don't know - I think it remains to be seen. 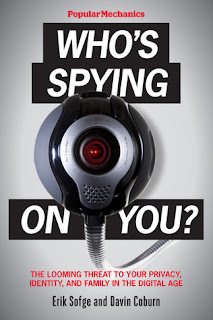 Who's Spying on You? makes a compelling case that even when data is anonymized before being shared, it can be reidentified quickly and easily with just a few pieces of the data that is concerned "unidentifying" - gender and zip code, for example. Add a birthdate to that, and you can narrow the possibilities down to only a few. Do you want your medical information shared with such flimsy anonymity? I don't. The last section of Who's Spying on You? covers the steps you can take to protect your privacy across the major areas where privacy is being invaded: your location, your home, your phone, your computer, your money, your medical history, and your kids. My only complaint about the book was that the copyediting was seriously sloppy. There were a few sentences that I absolutely could not parse, along with some generally lazy turns of phrase ("endanger species," for example, instead of "endangered"). I would expect a more professional presentation from such a respected institution as Popular Mechanics. Then again, books are my business, so maybe this doesn't bother others as much as it does me. The big selling point for me is that while much of this information is available on the web, it's nicely condensed here in book form (no one knowing what you're reading!) with a logical progression and solid recommendations. If you're at all concerned about your privacy, or curious about what you're giving up without even realizing it, this is a very good starting point. Disclosure: I received a free copy of this book to review. My opinions are my own.